As parents, we each develop our own play book. There are some things we are adamant about, some things we encourage, some things we discourage, and some things we just let go. For me, some of the MUSTs are: always use manners, be honest, try your hardest, and play a sport. That last one is where I lose a lot of supporters. I ran a poll on the Wondermom Wannabe Facebook page a while back and most people stated that they don’t require their children to play sports or a musical instrument (another must in my house). While most parents didn’t discourage these activities either, not many people felt as strongly as I did that they should be integral to a child’s upbringing. 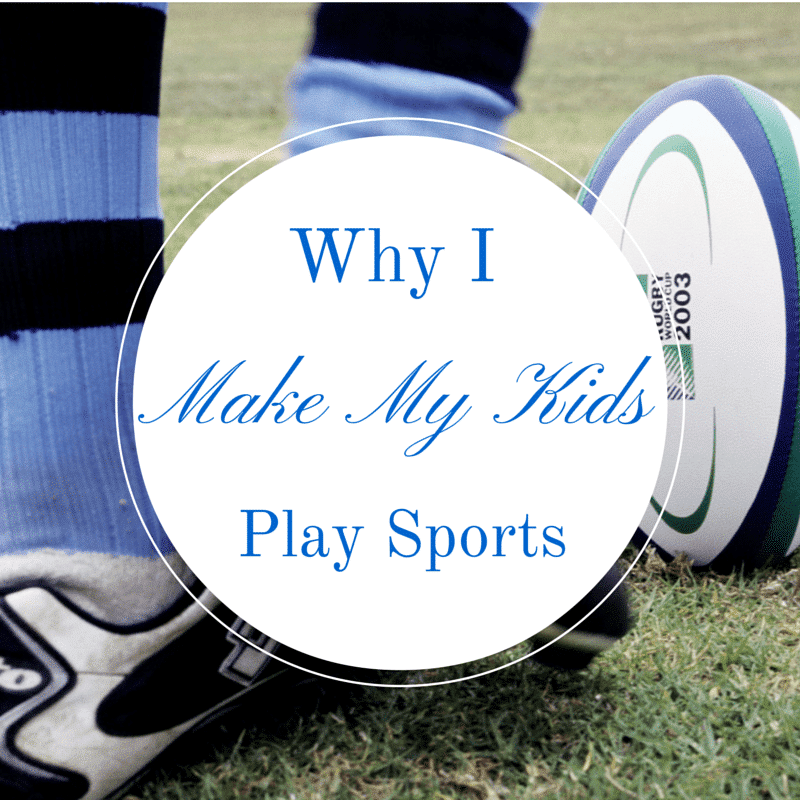 So, today I won’t try to persuade anyone, but I would like to explain why I make my kids play sports so that perhaps some might see the merits. Research has proven that our health habits are established during childhood (Psychology Today, NIH, FamilyDoctor.org). Once these habits are well established, they are VERY difficult to change. If you don’t establish a habit of physical activity for your children, the likelihood that they will get sufficient physical activity as adults is very slim. Not all children are natural athletes. My younger son tried a variety of sports since his small stature, lack of speed and awkwardness made him a poor fit for many “popular” sports like soccer, football, and basketball. He ultimately found his niche in martial arts where he could advance at his own pace. My goal isn’t for my children to become Olympic athletes; it’s for them to develop a habit of making time for physical activity. Your child’s self-esteem is built through achievement (KidsHealth.org). You can tell your child he or she is amazing, but it will be the accomplishment of goals that makes him or her believe it. Sports are an excellent way for your child to build self-confidence through achievement. Every new skill, successful maneuver, goal, hit, or win helps build up esteem. Through sports, children learn that practice and hard work can help them reach their goals (Working Mother). Also, simply being fit is a source of confidence for many individuals. Finally, the foundations of self-esteem are laid between the ages of 6 and 11 (Psychology Today), the ideal time to introduce children to new sports since in most sports these are the instructional, rather than competitive, years. Of course, not all of your child’s sports experiences are going to be successes. Fortunately, our children learn just as much from a poor performance or loss as they do from winning. If you present sports as recreation, for the purpose of developing healthy habits, it becomes a safe zone for experiencing setbacks or failures. Your child will learn to overcome obstacles and be resilient so that when faced with hurdles in other areas of greater significance (e.g. school or relationships), he or she will be better equipped to handle them. Even individual sports take place in teams (e.g. wrestling, swimming, running). At school, children are grouped primarily by age and academic level. In sports, they are usually also grouped by age but also by a specific interest (e.g. soccer). This is a great way for your child to connect with others based on a common interest. Also, I’m a firm believer that the more social settings one experiences, the better developed their social skills. Being part of a team helps your child learn to rely on others and to understand their own value to others. Though I require each of my children to participate in sports, they are each free to choose what sports they want to participate in. My oldest son is the wrestler; my oldest daughter, the gymnast; my younger son, the martial artist; and my youngest daughter plays a new sport every season. In our family of “athletes” each of them has their own area of strength and it carries over to their personalities (or perhaps their personalities influenced their athletic choices). My wrestler is mentally tough and fiercely loyal. My gymnast is hard-working and precise. My martial artist is the most self-assured and pensive. And my little one is a social butterfly with many interests. Their sports choices match their unique personalities and provide them a different avenue to express themselves. With so many different sports to choose from (soccer, tennis, football, lacrosse, track & field, basketball, swimming, dancing, gymnastics, martial arts, golf, and horseback riding just to name a few), it’s easy to find at least one physical activity that a child would enjoy. Though I don’t expect everyone to require their children to join a sports team, I do hope that after reading this post you might be encouraged to at least share the idea with your child or perhaps play some sports recreationally as a family. There is so much to gain! Previous Post: « Tasting Is Believing – You’ll Never Guess Who Makes These Desserts! That conversation (and a lot of mulling it over) lead me to start my blog. I really enjoyed your article and hope to link one of my articles to it in the future. My daughter was not a competitive person, but she did love being physical. She took Tae Kwon Do classes for many years and became a Second Degree Blackbelt. She didn’t like the pressure of being perfect that others might have put on her. She put a lot of pressure on herself to be the best though! An excellent post! I believe children should be introduced to all kinds of activities, but let them ultimately choose what they enjoy according to their aptitude. Sports and music ran high in our family too! I agree, exposure to a variety of activities is important for children (well beyond just sports). I wish I had been exposed to more things as a child when there’s less pressure associated with how we perform. I love the variety of sports you’ve exposed your children to. I wish hockey was more readily available where we live since it was one of my husband’s favorites as a child. LOL. I hear what you are saying about teens! Great article. My daughter was not competitive at all when she was growing up so she never thought she wanted to play sports. We found TaeKwonDo and she realized she could be physical and only compete against herself. I think that is also what my son likes about martial arts. He is a very sensitive and caring person and has a hard time trying to “beat” others. Hi Karen, thanks so much for your kinds words. I’m glad you brought up the issue of scheduling. Even if you find a sport your child likes and wants to participate in, that’s another obstacle to overcome and can be insurmountable. Another hurdle for us has been cost. We bought a new house last year that has really stretched our budget so we reduced the number of “paid” activities we were in and started backyard sports instead. We put up a volleyball and badminton net and now play one of the two every night after dinner. I am sorry that you had that perception. Your comment wasn’t deleted, it was simply in moderation since it was your first time commenting on my site. It’s an anti-spam mechanism. On the contrary, I welcome ALL comments. The goal of this site is to help parents make the best decisions for their families. I share my viewpoint as one option and I love when readers provide others. From the other side of the fence, I will never understand this mentality. Yes, there are some great lessons to be learned in sports. There are also other ways to teach kids those lessons. And forcing kids to mold themselves to what you want them to be (athletes) does NOT in any way encourage individuality. Which is why I have one child who doesn’t love sports and we will never make him do it. My other child, on the other hand, loves sports. And we have to suffer through practice being held up for those kids who clearly don’t want to be there or who are whining the whole time or just don’t try, and have to be talked into or even forced into participating every time they are asked to do something. That is completely unfair to the kids who want to be there and want to give it their all. I’m not talking about talent here, but effort. Sally, thank you for sharing your perspective from the other side of this issue. I agree that it isn’t fair to force kids to do things they hate. I hadn’t thought of encouraging physical activity as squelching individuality, but I do understand your viewpoint and think this is definitely a point to consider when parents are forming an opinion on this subject. After two years of dragging my son to soccer and football, we decided that he would play sports if it was his idea, but we did make him finish out the season of football even though he hated it and cried every time we drove him to practice. He was the littles guy on the team and I hated seeing him beat up by the rougher kids. But I do beleive in why you want your kids to play a sport, for me, I’ll just extend it to an after school activity that teaches the social skills, the team work and the practice makes perfect lessons. I am definitely going to give my kids the opportunity to try many different types of sports and hobbies, and see what they like and what they are good at. I agree that sports can be beneficial for many children! I am so with you on this, Corinne. Playing team sports teaches so many critical life lessons. And as the mother of 2 girls, I always told them that their goal is to be healthy and strong, not skinny. Playing sports helps build healthy strong children and people. Shalae, your comment means more to me than you know. I’m a BIG fan of your blog! Thanks so much for stopping by and sharing your thoughts.